perform over the year. I tracked the experiment and reported each month. The result? I ended the year down 85%, my $1000 worth only $150. Extend the Top Ten 2018 Crypto project one more year. The experiment is now in its 13th month. You can check it out the latest update here. I have also started a parallel project: on January 1st, 2019, I repeated the experiment, purchasing another $1000 ($100 each) into the new Top Ten cryptos as of January 1st, 2019. The lucky coins I’ll be tracking all year are: Bitcoin, Ripple, Ethereum, Bitcoin Cash, EOS, Stellar, Tether, Litecoin, Bitcoin SV, Tron. Let's get into it. 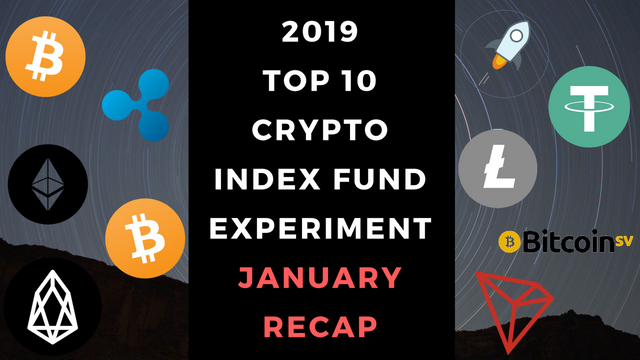 Here's the 2019 Top Ten Crypto Experiment update for January. Instead of hypothetically tracking cryptos, I made an actual $1000 investment, $100 in each of the Top 10 cryptocurrencies by market cap as of the 1st of January 2019. Think of it as a lazy man's Index Fund (no weighting or rebalancing), less technical, more fun (for me at least), and hopefully still a proxy for the market as a whole - or at the very least an interesting snapshot of the 2019 crypto space. Trying to keep it simple and accessible for beginners and those looking to get into crypto but maybe not quite ready to jump in yet. Well hey! That's not a bad start, only down about -9%. Considering after month one of the 2018 Experiment, I was already down -20%, I'll take it. It is also a nice change to see some green on the board with Litecoin and Tron finishing in positive territory. Already quite a bit of movement. Actually, all coins except the top three moved this month. Bitcoin Cash dropped to 5th place and has been overtaken by EOS. 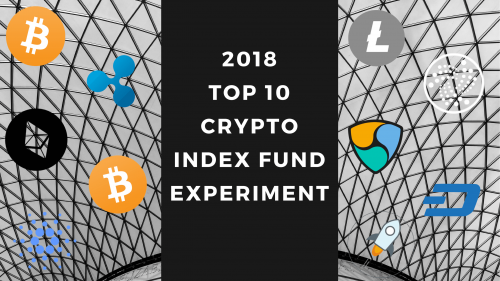 2018 Top Ten Experiment Champion XLM dropped from 6th place to 9th place and the end of January 2019, the biggest drop of the month. Tether and Litecoin each advanced one position and BTCSVslipped from #9 to #10. Tron made the biggest positive move, ascending two places from #10 to #8. Overall update – Tron takes an early lead, BTCSV has a rough start. January Winners - Tron hands down, up 35% in value and two places in ranking. A distant second is Litecoin up about 5% on the month. January Losers - BTCSV lost -32% of its value in January, followed by Bitcoin Cash down -29%. 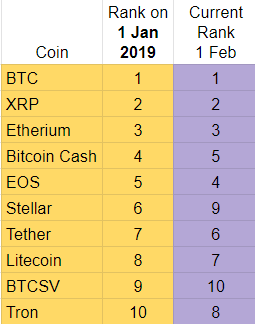 I'm just glad January didn't produce a Tether victory, that would have been a depressing start to the 2019 experiment. No offense, Tether. The total crypto market sank -13% in January. The value of the market has dropped from $132B at the start of 2019 to $114B today. Fairly flat, rising only a couple of percentage points. Bitcoin dominance has basically remained steady since September 2018. If I cashed out today, my $1000 initial investment would return $915, down -8.5%. January 2019 wasn't even close to how bad 2018 started. Yes, -8.5% is bad, but it has been worse. Much worse. Surprisingly, the experiment's focus of solely holding the Top Ten was a winning strategy this month as the overall market is down -13% in January. The 2019 Top Ten performed about 4.5% better than the market as a whole. This is already a bit unique: at no point in the Top Ten 2018 Experiment did this investment strategy work. The initial 2018 Top Ten under-performed every single month compared to the market overall last year. I'm also tracking the S&P 500 as part of my experiment to have a comparison point with other popular investments options. After a pretty significant December dip, the stock market rebounded quite a bit in January 2019. Had I redirected my $1000 investment to the S&P, I would have been up about $80 after one month as opposed to down $85 with the Top Ten Cryptos, a $165 swing. Not a horrible start to the year for the new 2019 Top Ten. I'm happy my nightmare scenario of having to report Tether as the champion for all twelve months of the experiment didn't materialize. It definitely helps that the market isn't starting 2019 from at/near all time highs. I expect the results of this year's experiment to be more positive than last year, but if I've learned anything observing the crypto market so closely last year, it's that this space is highly unpredictable. We'll just have to see what happens. Thanks for reading and the support for the experiment. I hope you’ve found it helpful. I continue to be committed to seeing this process through and reporting along the way. Feel free to reach out with any questions and stay tuned for progress reports.